(ARISE magazine, issue 16) Pianist Samuel Yirga is at the melodic heart of Ethiopian collective Dub Colossus. But left to his own devices, as he is on his brilliant debut long player Guzo, the 27 year old shows us his keyboard skill set stretches to classical, jazz and Latin too. “I took good experiences from the Dub Colossus tour and how audiences accept your experimental works,” he says. us he wanted to work with us,” remembers Yirga. “So we processed everything, went to the UK and made the first album with Dub Colossus. After that we started touring, and it’s been a great time for all of us”. are different styles in each group, for example I have a group Nubian Arc which plays Ethio-funk and jazz. Another group plays experimental Ethio-jazz and you can see the difference. It’s really bringing a change to the audience”. On Guzo, Yirga enlists the varied talents of The Creole Choir of Cuba, British/Iraqi singer Mel Gara and Nigerian-British vocalist Nicolette. 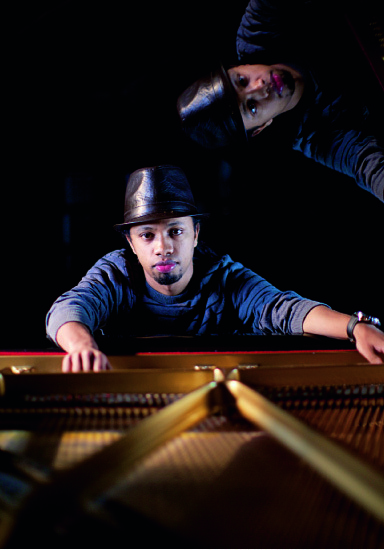 And he has a whole list of other artists he’d like to collaborate with, from established Ethiopian musicians such as singer, masenqo and krar player Alemayehu Fanta – “he’s amazing” – to acclaimed American jazz pianist Chick Corea, and Alicia Keys. Ms Keys are you listening?